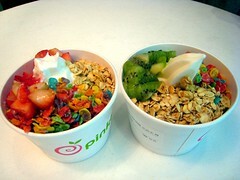 I always wondered who gets the non-fruit toppings. I saw these being constructed as I waited for my own, and was intrigued by the combination of fruit + fruity pebbles + granola, so I asked the designers if I could perhaps photograph their yogurt cups. Being rather boring, my own yogurt just had toppings of fruit. I was quite happy with how these turned out. Ever since our visit to Korea in January, I've been regularly craving kimchi. I didn't go out of my way to find any. I just put some in my basket while shopping at VONS. But while telling some people about this, the Real Live Koreans expressed dismay that I had been eating VONS kimchi and recommended that I get some higher quality kimchi from the Korean market. So yesterday on my way home from campus I went through Koreatown and stopped by The Galleria at Olympic & Western in search of quality kimchi. At the supermarket, it took me a while to get to the kimchi section. I entered near the produce and made my way across the store to the frozen section, and I felt a sort of buildup as I wondered when I would run into the kimchi. When I finally saw it, I was not disappointed. The humongous jars of kimchi I saw were Costco-worthy, and now I am really curious as to how long the huge jars ($18.99) would last a Korean family of four. Cathy at Epikorean tells me -- about a week, or two weeks MAX. The kimchi section had kimchi for sale in pouches, in addition to the stuff in jars. 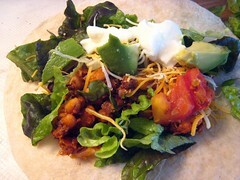 I went home with this (pictured above) 48 oz. 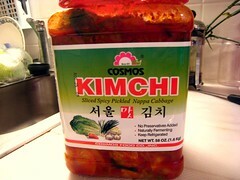 container of kimchi. I would say this is a mid-sized container, relative to the rest of the options I had available. I got nappa cabbage kimchi, which I think is the most generic (common?) sort. About this kimchi, it's pretty spicy. It's more intensely red and spicy than the kimchi I've picked up at VONS in the past, and Alex said "it's because you're white and wimpy". I disagreed about my being white. So now a question I have is, how much kimchi consumption is too much? Are there dangers of eating too much kimchi? As a probiotic, it's supposed to be good for your intestinal tract and improve your digestion. But all those spices have to be taxing on your system, right?